In this series of articles, we’d like to focus on Japanese traditional & seasonal event. 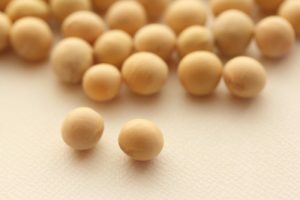 For the third choice will be the day before the beginning of Spring, called “setsubun”. 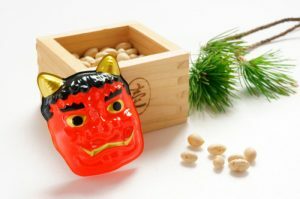 February 3rd is a holiday in Japan called “setsubun”. Even though it’s still so cold, it’s a holiday to celebrate the coming of spring, and it’s kind of a funny holiday. 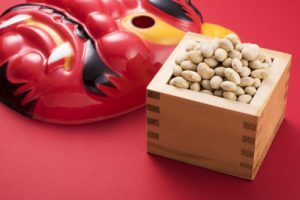 It’s a lot of fun for children in terms of “setsubun” involves a tradition of throwing dried soy beans! 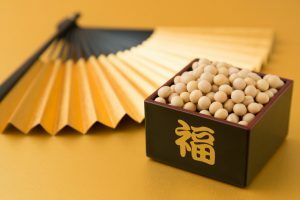 Throwing the soybeans represents getting rid of bad luck and welcoming good luck, and as we throw the beans, we say “Oni wa soto, Fuku wa uchi, and the word “oni” means devil or demon in Japanese, and we are telling it to go away. It’s common at bigger celebrations for someone to dress up in red like a demon where the kids throw beans at the demon until it leaves! It sounds scary, but it’s mostly fun for the kids but some of the little ones do get scared though.